Use: eliminate potential ground level fire hazards. 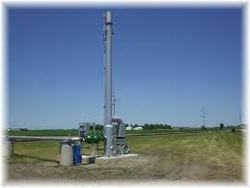 Application: waste gases from Petrochemicals, Oil & Gas fields, Refineries, Storages, etc. Kavya Pyro Oils Pvt Ltd.
We design and manufacture biogas flaring system, required for ETP, POME treatment plants in palm oil mills & other plants which generate biogas. The Biogas Flare combines a sturdy quality with a unique compact design aimed at simplicity. This means that methane-rich biogas of a low pre-pressure can be discharged safely and reliably without involving failure-prone rotating equipment such as ventilators or control valves. Flaring of biogas is mostly done with minimal facilities and without energy recuperation.Where there is more gas than can be used in the energy recovery system (through unusually high gas production rate or through breakdown/maintenance of the energy recovery system) then additional measures are necessary to eliminate the safety risks and protect the environment. The FAB series flare is used for smokeless combustion applications, where the use of steam is not desired. Smokeless combustion can be obtained even with heavy unsaturated hydrocarbon gases. Kothari Sugars / UP Petro & Cetex Ltd., Manali, Chennai. 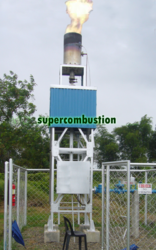 Air-Oil Flare Gas India Ltd., Nagarjuna Fertilizers & Chem Ltd., Kakkinada. This project recovers gases that are lost to the flare and to utilise it as fuel, thereby saving cost. This also helps to reduce the Carbon footprint of our company by reducing greenhouse gas emissions.